For Western home computer versions, see After Burner (home computers). After Burner (アフターバーナー) is a third-person rail shooter arcade game designed by Yu Suzuki and developed by Sega AM2, released for the Sega X Board system in 1987. The game was released in three variations: a standard upright cabinet, and two cockpit versions, one that tilts left and right, and one a rotating cockpit version. An updated version was released months later, After Burner II. 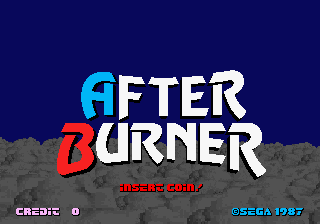 After Burner stands as one of Sega's most successful arcade games, building on the momentum started earlier in the decade with Hang-On, Space Harrier and OutRun. It was the first game to utilise Sega X Board technology, allowing for the easy scaling and rotation of in-game sprites, producing three-dimensional graphics. It is also remembered for its then-revolutionary sit-down cabinet design, complete with a horizontally rotating seat and a vertically rotating cockpit, controlled (like the game) by the integrated analog flight stick, with the cabinet's motion corresponding to the joystick's movement. Its analog flight-stick controls moved in all directions and measured the degree of push, a precursor to the analog thumbsticks of the N64 and later consoles. After Burner's gameplay also featured a lock-on system, which was adopted by later rail shooters such as Sega's Panzer Dragoon and Rez. In After Burner, the player pilots an F-14 Tomcat-inspired jet through 18 levels, destroying enemies with machine gun fire and a limited supply of missiles. Similar to Space Harrier, it is an "on-the-rails" shooter - the plane will travel continuously into the screen, with players only able to adjust its X and Y coordinates. The objective in After Burner is to survive through each of the 18 stages, usually by avoiding enemy missile fire, however "bonus" stages, which occur every six levels, require the player to dodge scenery and not crash. Shooting down enemies is technically optional, although alleviates the risk of being destroyed. The player has a limited supply of missiles which are refueled at various intervals throughout the game. The game was also influenced by popular culture. Suzuki was originally inspired by Hayao Miyazaki's 1986 anime film Laputa: Castle in the Sky, and the game was going to have a similar steampunk sci-fi/fantasy theme. After watching the 1986 Hollywood film Top Gun, the team realized that the game needs to attract worldwide audiences, so they changed it to a more realistic theme with an F-14 fighter jet. The game was intended to start off in the Mediterranean and head towards Russia, but the team didn't have the time to scout out locations like they did for Out Run, so much of the scenery in After Burner ended up being imaginary. A major challenge when creating the game was sprite/texture rotation, researching how to rotate the surfaces of the sprites, which was a major milestone. Another major milestone was making the smoke trails from missiles look more realistic. After Burner was originally designed to have melodies play over the "After Burner/Red Out" and "Final Take Off" music tracks, but these were taken out of the final game, potentially through fears that they'd be drowned out in a busy arcade environment. Though these versions were never heard in the arcades, they adapted for the album Sega Game Music Vol. 3 After Burner in 1987 (appearing in other albums since), and have been brought back as options in later games (for example, 3D After Burner II). The melodies were also used for the FM Towns version released in 1989, in a remixed CD format. The original After Burner was released exclusively in Japan, however the western world would receive an updated version of the game, After Burner II in the months which followed. After Burner II is extremely similar in design, bar a few minor tweaks (such as a throttle control, extra levels and slight changes to the missile system), so much so that people often consider it to be a more "complete" version of After Burner than a direct sequel. Due to the similarities and shared cabinet designs and artwork, After Burner II is frequently confused for the original After Burner. A similar relationship would develop with Galaxy Force and Galaxy Force II, also produced by Sega AM2. In its original form, After Burner was only ported to the Sega Master System (as the console's first four megabit gameMore...), however many ports of After Burner II were released under the name of After Burner for home consoles and computers, including the Amiga (twice), Amstrad CPC, Atari ST, Commodore 64, IBM PC, FM Towns, MSX, PC Engine, X68000 and ZX Spectrum. It was also ported to the Sega 32X by Rutubo Games and went under the name of After Burner Complete. After Burner in its original form was also released as part of Sega Arcade Gallery for the Game Boy Advance. After Burner has made appearances in popular culture. For example, it made an appearance in the 1991 film Terminator 2: Judgment Day. Main article: After Burner/Magazine articles.